As I was blowing purple snot out of my nose, I realized how unique my day had truly been. 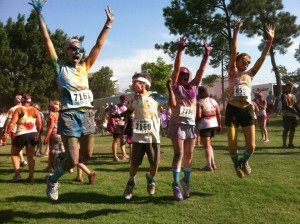 I got to join the team from DietsinReview.com and participate in The Color Run last Saturday in Tulsa. Not knowing at all what to expect, I was so surprised. Thick-headed, prideful me, let go and enjoyed an un-timed 5K. I bonded with my workmates and best of all, got to have a blast with Judah. I’ve been working on letting go and enjoying the life that allows me to be active. Not every day is a competition. In the spirit of doing new things and learning to enjoy life more, our family got a great idea this week. Kenton and I started watching The Buried Life to pass our summertime TV blahs. If you aren’t familiar, in a nutshell, the show follows four college boys who have set off to start marking off items from their “bucket list.” Along the way they continue to ask strangers, “What do you want to do before you die?” As these young crazy boys were being a little reckless and very entertaining during the first few episodes, I was inspired. Granted, I have no intention of making a toast at a stranger’s wedding (#41 on the boy’s list and a hilarious episode! ), but I have so many things I do want to do before I’m toes up. The list has always been in my head and some of the items get more embarrassing. I intend to start writing these things down and take time to reflect on how I can accomplish these things before I look up and it’s too late. Oh, it matters. You Live Only Once is our new motto. Knowing that the Great Wall isn’t a reality this summer and doubtfully will I have time to join a ballet class, I was determined to start living more, even if it’s on a smaller scale. My family was right beside me on this plan. This resulted in our ever growing “Summer 2012 YLOO List.” We started scrawling items down at lunch yesterday and it keeps getting bigger. Bear in mind an 8 year-old is living out his dreams in this process too, so some items are straight from his brain. For now, we have 10 items we’ve declared we’re completing before August, 1 2012. Be inspired or have fun watching us cross off our items. “Life is short” “You live only once” “Get busy living or get busy dying.” You’ve heard all the lines, but are you going to let their truths change you? I like this YLOO thing…the word “bucket list” is kind of depressing. YLOO sounds a lot more fun. As you know, writing this stuff down gives it a life of its own and really empowers you. Something I don’t do enough of is writing down my goals. Thanks for the inspiration, Lacy.